The 46th Academy of St Thomas season begins on Saturday 2 March 2019 at St Andrew’s Hall, Norwich, with the stunning young Korean violinist Julia Hwang performing the wonderfully lyrical romantic Bruch Violin Concerto. The programme also features the vibrant Italian Symphony by Mendelssohn, which was inspired by the colour and atmosphere of Italy during his Europe tour in 1833. The players of Academy of St Thomas are drawn from professional musicians and peripatetic teachers who donate their talents in order to play in a high-standard orchestra. Concerts have been acclaimed for their high professional standards and exhilarating performances. First 100 under 18s free (then £8). Maximum 3 per adult (ask Box Office for details – 01553 764864). On Sunday 24 March 2019, Norfolk Symphony Orchestra present a vibrant, energetic and vividly colourful concert of American classical music at St. Nicholas’ Chapel, King’s Lynn. The programme explores works from American composers of the 19th & 20th Century who enthusiastically embraced their chance to make a new start. You can hear many different influences in the programme from the rhythms and sounds of jazz to the hypnotic repeating patterns of minimalism. More information at www.nso-uk.co.uk. Calling all horn and brass players! Don’t miss the chance to hear horn superstar Katy Woolley as soloist in Strauss’ First Horn Concerto with the Norwich Philharmonic Orchestra at St Andrew’s Hall on Saturday 9 February 2019. 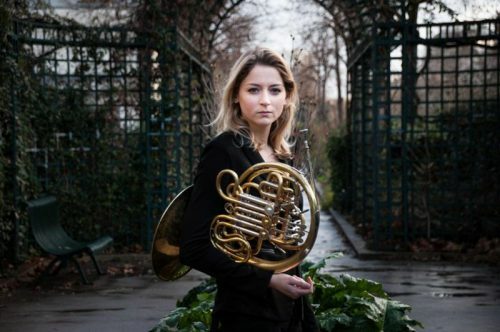 Principal horn of the Philharmonia until 2017 and still only 29 years of age, she has just been appointed principal horn of the Royal Concertgebouw Orchestra, Amsterdam, placing her in the top rank of the world’s finest horn players. Norwich Philharmonic is a full-size symphony orchestra and a mixed chorus of some 120 voices, the Society performs a wide repertoire of large-scale works, joined by guest soloists of the highest calibre. ‘The Phil’ performs at St. Andrew’s Hall and gives four concerts of choral and/or orchestral music each season, plus a very popular Family Christmas Concert. Norfolk & Norwich Festival would like to bring as many young people close to the arts as possible and is offering a young persons’ discount to see Grammy award winning pianist, entertainer and musical scientist Chilly Gonzales, who brings his show to Norwich Theatre Royal on Wednesday 15 May. Interspersed with his unique, playful explanations about how music works, Gonzales is highly regarded for his genre-defying approach to the piano and his showmanship. You can get a taste of Chilly’s work BBC Radio 1’s Piano Sessions, and find out more about the show on the NNF website. If you want to find more listings for what’s on in Norfolk, there is a comprehensive round-up of all the classical, jazz and world music events in the Norwich area on the Music in Norwich website.